Would use of an ultrasonic cleaner to clean coins be considered acceptable practice with old coins? Yes, but (i think) only for sea salvaged coins and the like. If used on modern coins, I have no idea, but think no. I've read somewhere that this is frowned upon, not sure how anyone will know if a coin has gone through the process. The first rule of cleaning coins is DON'T! It depends entirely on the coin and why the coin needs to be cleaned. If the coin has some debris attached to it (like in the case of salvaged coins like Pierre mentioned) it is OK to do it. Also there are also some substances that will damage the coin with prolonged exposure, for example PVC contamination, in the case where coins where stored in coin pockets containing PVC. Even once the coin is removed from the PVC coin pockets, the PVC remaining on the coin should be removed as it can still damage the coin (I am not sure if ultrasonic cleaning will do this though). The most important thing to know is that more (apart from circulation and melting) of our coins has been damaged/destroyed by cleaning than any other method. I buy a lot of ZAR coins and at least 95% of the coins that I see have been "improperly" cleaned, to the extent that the surfaces of the coin have been damaged. The last point that I want to make on this is that natural toning is NEVER a reason to clean a coin. Many collectors, me included, will rather buy a nicely toned coin. The only exception to this might be brilliant UNC coins, but cleaning these is best left to the professionals. 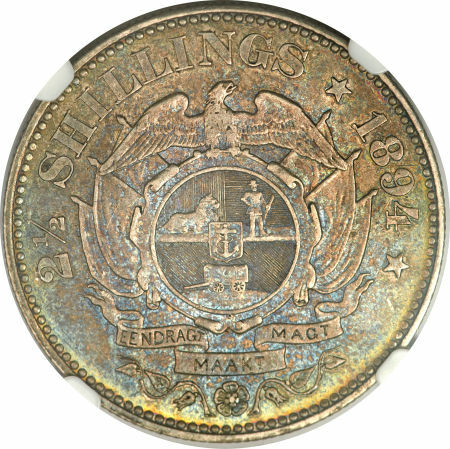 Take a look for example at this 1894 Halfcrown, in my opinion, the lovely colors showing up on the coin is significantly enhancing its appearance. Cleaning a coin such as this will drastically reduce its eye appeal. Personally, the only “cleaned” coins that I would buy would be truly rare coins (the ones I collect) that I would not be able to afford in uncleaned state. I know that NGC grade these coins (or used to) as “environmentally damaged “– even a gold (uncleaned) Mohur from the Fame (that I personally dived) got that rating from NGC – but that is exactly what one would expect from a shipwreck coin. Some collectors, like me, could not find better proof that a coin originated from say the Reigersdaal or Meerenstein, than some evidence that it had been cleaned by electrolysis in the past. In an article by Dr Glen â€œTowards a cure for the PVC menaceâ€ on his research into ultrasound cleaning states whilst fairly good results were obtained, there were several problems reported, and he obtained better results with Acetone solvent.